Pepperfry is providing Rs.200 OFF on a minimum purchase of Rs.400. Pepperry is one of India's leading online shopping site which caters all our home needs. I have bought so many items from Pepperfry for my home. 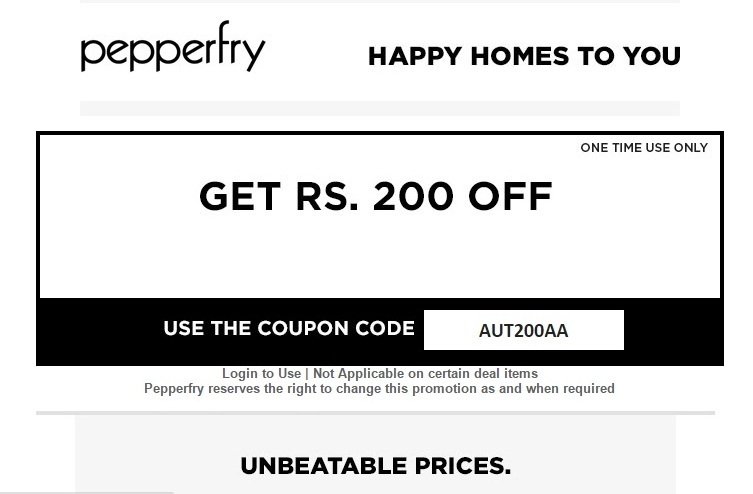 Pepperfry is now offering 200 OFF coupon. The coupon might not work for everyone. It might be for limited users only. Try your luck whether you are able to use this coupon. 1. Login to Pepperfry.com using your login credentials. 2. Add the products to cart. Some products might be in deep discounts. You might not be able to use this code on those products. You can check whether the specific product is available on offer in the product page itself. 3. Apply coupon code - AUT200AA. 1. You have to login first before applying the coupon. 2. The coupon is a limited coupon and you have to check your luck. 3. The coupon code is not applicable on certain deal items. 4. Pepperfry reserves the right to change this promotion as and when required. 5. Peppefry terms and conditions are applicable. 6. Only people who receive an email regarding this offer will be able to use this coupon.